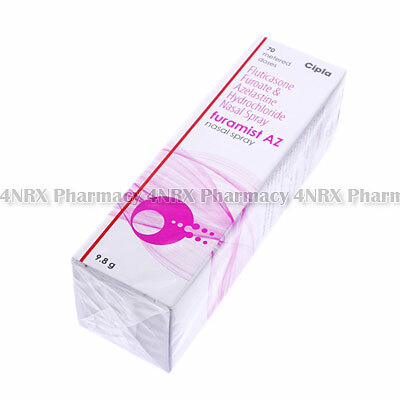 What is Furamist AZ Nasal Spray (Azelastine/Fluticasone) used for? Furamist AZ Nasal Spray (Azelastine/Fluticasone) is a combination of antihistamine and steroid medications used to prevent allergic and inflammatory reactions. The medication operates by blocking histamines to reduce increased blood flow to the nostrils caused by allergens to prevent these symptoms. Your doctor may also recommend its use to treat other conditions not listed here. How should I use Furamist AZ Nasal Spray (Azelastine/Fluticasone)? Always follow the instructions of your doctor while using Furamist AZ Nasal Spray (Azelastine/Fluticasone) to get the best results from treatment. One or two sprays is normally administered into each nostril two times each day, but the best instructions will be determined by your health condition and the severity of your symptoms. To administer the dosage gently shake the bottle to mix its contents, remove the top, put the applicator up the nostril, and inhale deeply while squeezing the bottle to dispense the dose. If more than one spray is required, you are recommended to alternate nostrils to prevent irritation. Ask your doctor about anything you are unsure of to make sure you are using the medication correctly. What are the side effects of Furamist AZ Nasal Spray (Azelastine/Fluticasone)? Serious side effects that may require emergency medical attention are chest tightness, difficulty breathing, or irregular heartbeats. Contact your doctor as soon as you experience any worrying symptoms to make sure any necessary adjustments are made to your dosage or application frequency to prevent further health problems from occurring. Never administer Furamist AZ Nasal Spray (Azelastine/Fluticasone) to a patient that is a child under five years of age. It is also important to note that the medication should be kept away from the eyes, ears, or mouth. If you are operating the pump and not applying your doses, always point the applicator away from your face. If it has been more than six months since opening your medication and there is still some remaining, dispose of it and get your prescription refilled. Furamist AZ Nasal Spray (Azelastine/Fluticasone) may not be safe or suitable for all patients. Always ensure your doctor is informed if you are pregnant or breastfeeding, using any other type of medication (including non-prescription medicine, vitamins, and supplements), as well as if you have any allergies, other illnesses, or pre-existing medication conditions.